Forklift Training and MEWP Training in Exeter, SW Forklift Training Onsite FLT Training at Affordable Prices. Expert Professional Forklift Training for Exeter Taunton and The West Country. We are an independent local onsite forklift training business delivering nationally recognised flt training at all levels to the material handling industry. Our training is fully compliant with the HSE code of practice L117. We are forklift training experts with over 20 years experience in the British Army, and we firmly believe that we offer the most affordable onsite forklift training in the UK. We regularly carry out forklift training in and around Exeter and Taunton and we do this on our customers own machines within their own premises as we believe that this instils greater confidence in trainees as they are being trained on the machines that they will use in their own familiar work environment. 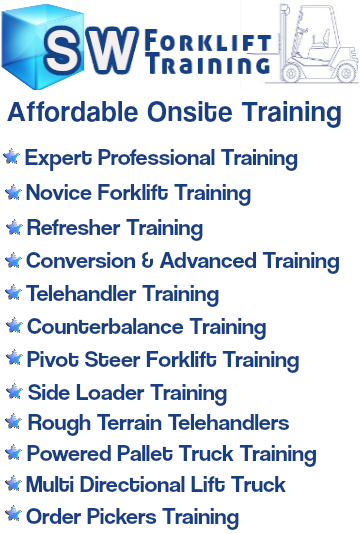 SW Forklift Training Who Are We And Why Should You Use Our Onsite FLT Training? We are based In Newport South Wales and have many clients in and around Exeter and Devon. We meet our clients lift truck training and MEWP training requirements in at times to suit our clients not us, this means that you have your staff trained on your own premises at a time and date that suits you, we offer flexible times so that you business down time due to training is kept to a minimum. SW Forklift Training was established to provide cost effective flt training for companies businesses originally local to us, as time has progressed then due to requests from clients we have expanded our area coverage to accommodate new clients in adjacent area’s whilst still keeping our prices highly competitive. Therefore we are able to provide expert lift truck training and MEWP Training at very competitive prices. Our Forklift Training Business achieves this by working from a local home office, keeping costs to a minimum and passing those savings on to our many clients. This does not mean that the quality of our training standards are compromised in any way, as out training is given by nationally registered instructors, and our training is fully compliant with the HSE code of practice L117. Expert Training and Professional Advice on Forklifts and MEWPs at Prices That all Businesses Can Afford. Whilst cost control is always important in any business, one of the benefits that our clients enjoy is our practice of training our clients employees at our clients own premises, on the machine or machines that they will be using. It is recognised that when your staff have flt training or MEWPs training onsite in familiar surroundings, the level of competence and confidence is increased, simply because your employees feel relaxed and are more receptive within their own work environment, this results in improved confidence and productivity rolling on to improved profitability. We Offer Flt Training and MEWP Training On Many Machines. Providing Flt training at Novice, intermediate experienced and refresher levels as well as conversion levels. We also provide MEWPs training in Exeter Taunton Bristol Worcester Birmingham to mention but a few of our training locations. We are very proud of our training and safety record, and just as proud of or client base which includes many major businesses in the UK. We have carried out forklift training for many major businesses thought the UK. We are able to offer affordable forklift training and MEWP training at many levels for our clients employees, we implement training when our clients need their staff trained, this helps minimise any down time due to forklift training and or MEWP training. We do not work 8-5 we work when our clients need us, and where our clients need us, on our clients premises. For Forklift Training Swindon Click Here. Forklift Training and MEWPs Training in Exeter, Taunton, The West Country, The West Midlands and Wales. Onsite Flt Training From Expert Trainers With Over 20 Years Experience Within The British Army.